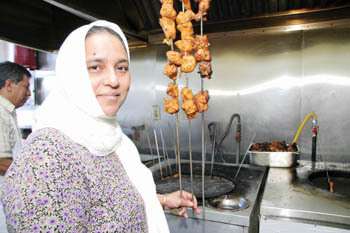 Skewered Perspective: Zebun Nisa, wife of owner Mohammad Usman, serves up chicken. BECAUSE IT IS tucked into a quiet, semiresidential side street away from the hubbub of nearby El Camino Real, Santa Clara's Kabab and Curry's feels like a neighborhood secret. It's in a plain boxy building with apartments above it. Across the street are a Taco Bell and a defunct lumber mill. But word about this 5-year-old restaurant is out. The restaurant attracts a multiethnic crowd. Because it's a halal restaurant, meaning the meat is butchered in accordance with Islamic law, it draws a large number of Muslim diners. The owners, who come from northern India, have hung quotes from the Koran on one corner of the restaurant. There's a mosque down the street, and the place gets waves of business before and after evening prayers. At lunch, the restaurant reflects the diversity of Silicon Valley. Muslims and South Asians sit side by side with Dockers-wearing office workers of diverse nationalities united in their affection for good, cheap Indian and Pakistani food. Because of the hard surfaces in the restaurant and the lack of open windows, the place can get quite noisy. And with the recent spike in temperatures, the dining room verged on being too hot. But the owners were working on the air conditioning when I was there so that problem may have been solved. Across the board, almost all the dishes I tried were excellent and made with a graceful simplicity. At $8, the lunch buffet is a great deal. The food is made in small batches, so it stays fresh and is frequently replenished. You grab a plate and get in line. Pay when you're done. On my visit, the buffet included tangy and moist chicken tandoori, lamb curry, narratan korma, aalo gobi and cinnamon- and bay leaf-spiked basmati rice. Once you find a seat, a server plunks down a basket of naan and a pitcher of water. In addition to the tandoori chicken, the narratan korma (peas, green beans, lima beans, carrots and other vegetables in a creamy curry) and the aalo gobi (potato and cauliflower, sometimes spelled "aloo") were best. The only buffet dish that left me flat was the lamb curry. While tender, the sauce was one-dimensional and drab. The naan is best at dinner when it's made to order. During lunch it's made ahead of time and is too dry. But out of the oven, it's chewy, hot and puffy. At dinner, the restaurant puts away the steam table and waiters appear. I've heard complaints about slow service, but we were promptly waited on and got our food quickly. The two dining rooms are spotlessly clean and decorated with simple wall art. Tortoise shell-colored pendant lights hanging over the dining room give the place a modern feel. Although the restaurant's name suggests it serves a number of kebabs, there are only two on the menu, chicken ($6.95) and a ground-beef seekh kabab ($2). I tried the latter, a tender, pleasantly charred skewer of highly seasoned meat served on a bed of sliced onions. Butter chicken ($6.95) is similar to tikka masala, but richer and spicier. The boneless and bone-in chunks of chicken are suffused with the reddish-orange curry. The sauce is flecked with herbs and spices and finishes with a lingering spiciness. I couldn't stop mopping it up with chunks of naan. Aalo baigun ($3.95), stewed eggplant, is slow cooked to the consistency of caramelized onions but retains the color and texture of the vegetable. I also like the choley ($3.95), garbanzo beans simmered in a rich, deep-brown curry that sneaks up on you with a flickering spiciness. As I mopped up the last of my lunch with a swipe of naan, I gazed out the window across the street and watched customers creep through Taco Bell's drive-through in the noonday heat, barking their order into the intercom. They don't know what they're missing, I thought to myself. I'd take butter chicken and basmati rice over a chalupa any day. Address: 1498 Isabella St., Santa Clara. Hours: 11am-2:30pm and 5:30-10pm Tue-Sun. From the June 1-7, 2005 issue of Metro, Silicon Valley's Weekly Newspaper.